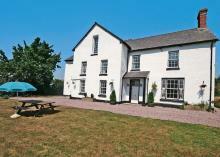 Brookside Manor House is a superb detached property in the Glyn Ceiriog Valley near to Chirk in Shropshire. The property sleeps thirty people and has ten bedrooms and seven bathrooms. Also in the house are a large kitchen, a dining hall, a sitting room, a library, a snooker room and a conservatory many with woodburners. Also included is shared use of a swimming pool, a sauna, a hot tub, a tennis court, two squash courts and a gym. Outside are magnificent gardens with outdoor furniture and a built in barbecue. Set in glorious countryside, Brookside Manor House is a stunning property that will live long in the memory.